I have not posted in a while, so today we'll talk about something a little different: European heraldry. The first thing anyone knows about heraldry is probably its first and most fundamental rule -- the "rule of tincture." Tincture is just the proper term for what we would casually call colors, whereas colour properly refers to the darker of the heraldic tinctures: azure, gules, purpure, vert, and sable. Metal refers to the two light tinctures, argent and Or. Furs, such as ermine and vair, are representative of animal furs and could count as either colour or metal depending on how light or dark they are. The rule of tincture states that metal should not be placed on metal, nor colour on colour. Simply put, it is an issue of contrast -- light should not be next to light, and dark should not be next to dark. This rule is reasonable enough -- it follows natural aesthetic and one can guess quite easily how it came about. 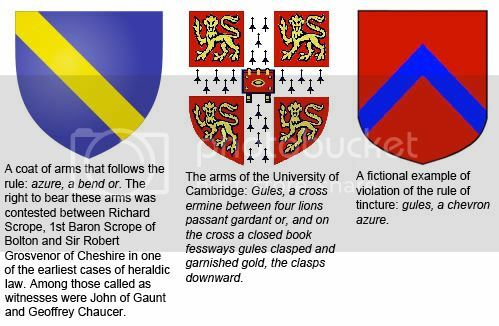 Since the design on a coat of arms originally served identification purposes on the battlefield and at the jousting tournament, it is practical that the design should be in high color contrast so that they may be recognized at a distance or in the flurry of movement. Arthur Charles Fox-Davies, the British author on heraldry, writes "This is a definite rule which must practically always be rigidly obeyed." It is not, however, an enforced rule, since there is no over-arching organization governing heraldry, and besides, different countries have different heraldic traditions. Rather, it is an empirical rule of which statistical analyses can be made, although no study can ever be completely definitive because you'd be dealing with using different sources and rolls of arms, incomplete medieval records, and that kind of morass. Violations do occur, with the colour-on-colour variety occurring more frequently than metal-on-metal. The British Isles follow the rule the best, with the rule being weaker on Continental Europe, and generally speaking, you can count on the rate of violations increasing the farther you get from England. The Albanian coat of arms, for example, sports a sable eagle on a gules field. According to the medieval scholar Michel Pastoureau, who conducted a study of 10,000 arms from 13th-15th century armorials of Western Europe, only the kingdoms of Castille and Grenada reached a violation rate of greater than 2%. In French, such violations are termed armes à enquérir, because the rule of tincture is so well known that any violations are assumed intentional, so one is supposed to inquire how it had come to pass upon seeing it. The most famous armes à enquérir is of course the coat of arms of the Kingdom of Jerusalem (often wrongly cited as the only violation), which is blazoned argent, a cross potent between four crosslets Or. These arms were actually the personal arms of Godfrey of Bouillon, Duke of Lower Lorraine, a leader of the First Crusade. After the Christian army captured the Holy Land, Godfrey, along with fellow leader Raymond of St. Gilles, Count of Toulouse, were deemed the two most worthy candidates as ruler over the newly established Crusader state. Although both wished to rule over the Holy Land, neither wished to be crowned King in the city where Christ was crowned with thorns. Raymond refused the offer of the crown at first, thus showing his piety, but he probably expected the nobles to elect him to the throne anyway. Godfrey was however the more popular leader, and he did no damage to his pious reputation when he accepted a vaguely defined secular office, infuriating Raymond, who stormed out of the city with his troops. And so it came to pass that the golden cross-on-silver became the coat of arms of the Kingdom of Jerusalem, which lasted from its establishment in 1099 until 1291 when the Mamluks captured its last remnants. One theory of the origins of Godfrey's arms is that he originally carried a plain white papal banner, with the golden cross incorporated later on. In any case, later scholars interpreted the Kingdom of Jerusalem's unique coat of arms of argent and Or as an indication of the special religious significance of the kingdom, much in the same way an argent and Or violation is also present in the coat of arms of the Holy See. I have really enjoyed your posts so far, I hope there are more in the future, though I know many things can get in the way. I am actually Guy's high school friend, though some of the posts here are indeed his.